Discuss the use of models by scientists and the fact that all models have limitations. Review the details of sea-floor spreading. Review the different types of plate boundaries. Cut two identical strips of white paper, each 7 cm wide by 30 cm long. Cut an 8 cm long slit along the width of the bottom of the shoebox. To record data, title a sheet of paper "Model of a Divergent Plate Boundary". Students will use this sheet to record their observations about the model they create. Time to complete lab: about 45 minutes. Put the two strips of paper together and push one end through the slit in the box. Place the shoebox, bottom-side up, and let about 5 cm of the paper strips stick out of the slit. Separate the strips and hold each one down against the surface as shown in the photo on the right. 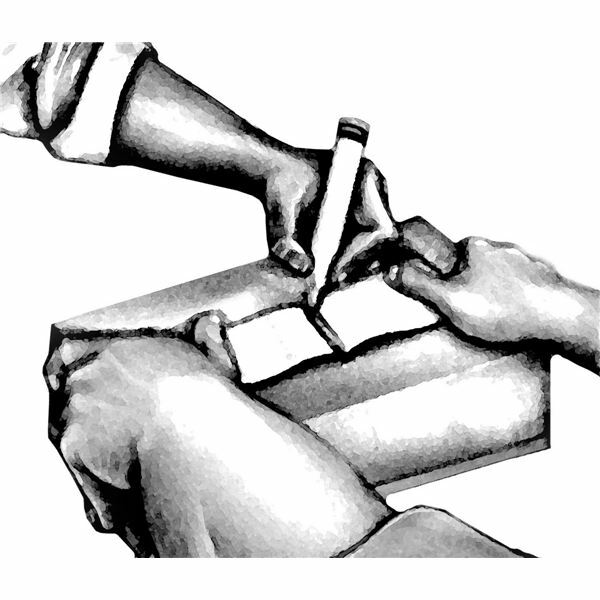 Use one of the markers to make a mark across where the papers come out of the box. Be sure each strip gets colored with a stripe about 1 cm wide. Pull the strips evenly so that another 1 cm comes out of the slit on each side. Use a second marker to color all the new white paper now visible above the slit. On the data sheet, the student should describe what they observe. Repeat step 5 until both strips of paper are pulled out of the box. Use a different color marker with each marking. When finished, draw on your data sheet a picture of what the strips look like. Ask students to write a report explaining how their model shows that oceanic crust is created. Discuss how it models the creation of magnetic patterns in the rock of the ocean floor. Describe how the actual earth differs from the model that you built. To extend the study, challenge students to develop their own models for the different types of convergent plate boundaries.